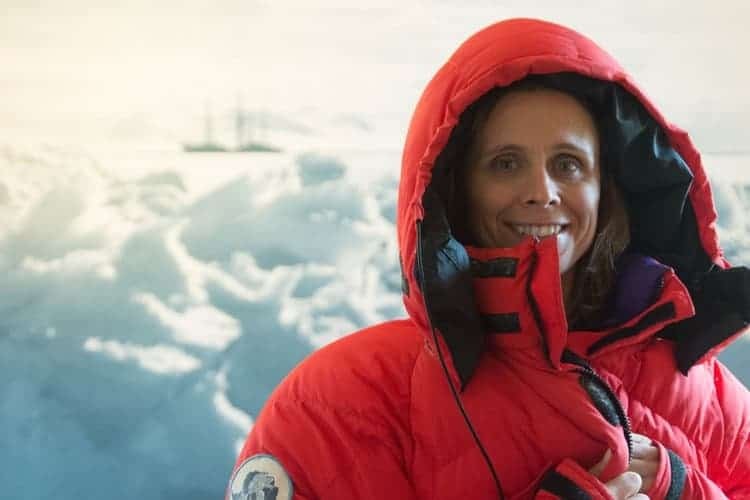 How does a mum from Wiltshire end up leading an expedition pioneering a new route to the geographic South Pole? 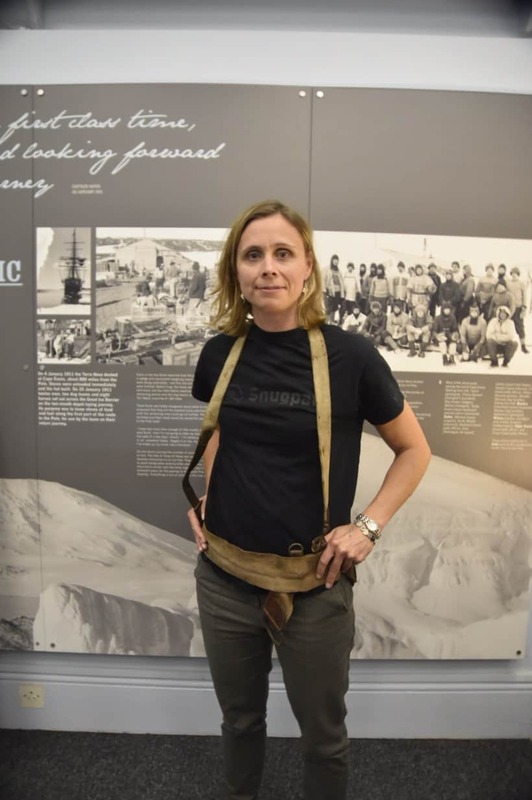 We caught up with Wendy Searle – mum, writer, snowboarder, skydiver and expedition leader – to find out about her South Pole 2020 expedition and how exactly she got here. Environment I like the most: the mountains and the coast – can I have both?! My dream adventure: The one I’m planning – skiing to the South Pole! Can’t go on an adventure without? My trusty 20+ year old walking boots, Vaseline [for chafing, and for lighting fires! ], kissing my children goodbye. I grew up in Bedfordshire, possibly the flattest county in England! 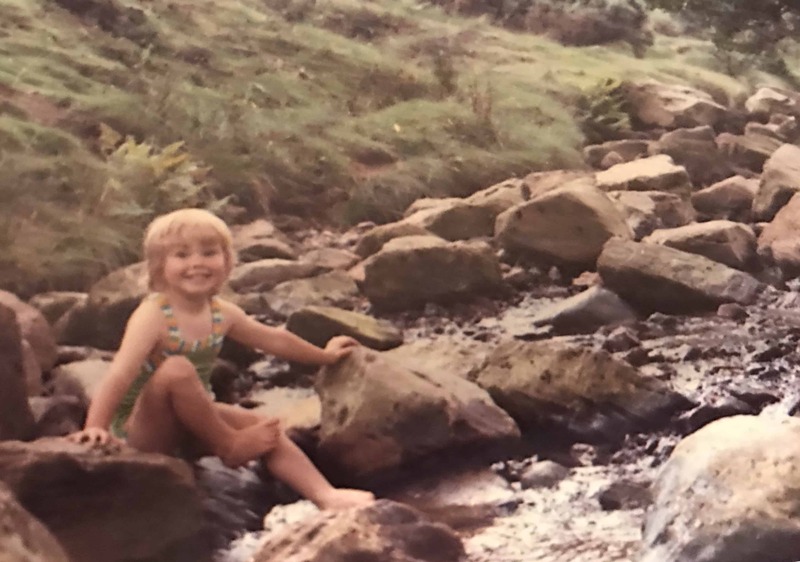 My brothers and I had a wholesome childhood of playing outdoors, building dens, going on walking and cycling holidays and having probably more freedom than my mother really knew about – we were slightly feral! I went to an all-girls school in Hitchin – we were encouraged to do physics as much as we were domestic science – although I went on to study English, the expectation that we could do anything we wanted to do really stuck. I have always been a writer – either as a journalist or now in PR and communications. My children range in ages from 8-18 – there are four of them! Have you always had an adventurous streak in you? I’ve been thinking about this a lot since I started to plan a big expedition. I would definitely say yes. My father expected me to take on the world – I was treated exactly the same as my brothers. I remember at middle school Mrs Summerfield telling me ‘you think the rules don’t apply to you.’ At the time she was trying to tell me off – I realise now that she had it exactly right – I don’t believe there are barriers to doing anything you really want to do. 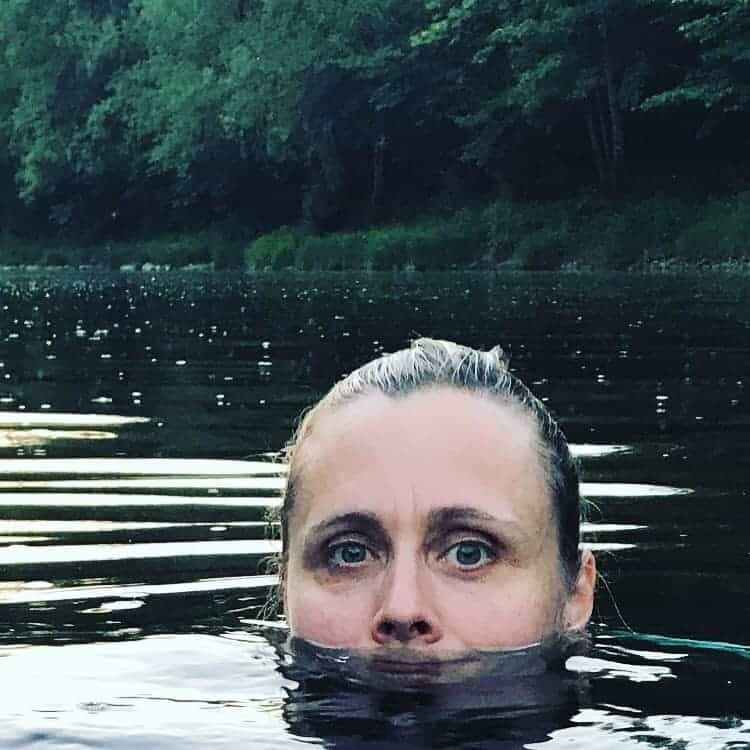 I’ve done lots of smaller things – solo wild camping, wild swimming, the Three Peaks, trail marathons, but really I’m starting from a modest collection of mini-adventures. But that’s how you start! It means I can make a lot of progress quickly. How did you first end up going on a skydive and what was it like? My first skydive was a spur-of-the-moment thing. 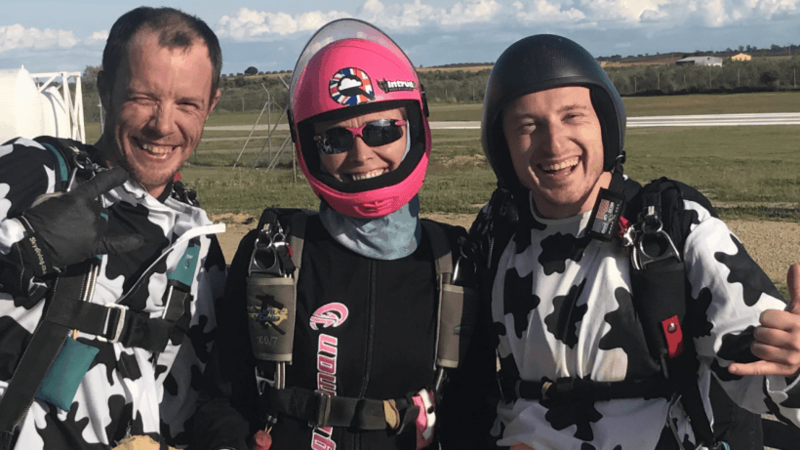 I’d already signed up to do a skydive for the charity I worked for, but it had been giving me sleepless nights from the moment I signed up (a year before!). I was watching a friend do a jump and they had space for a tandem so I did it before I lost my nerve! Then how did you develop into a frequent skydiver? Well, the second I left the plane I thought ‘this is the most amazing, euphoric, terrifying, real moment, this is what I want to do for the rest of my life.’ I signed up for my accelerated free-fall (AFF) course that week and have never looked back. I was truly scared for the first 50 or so jumps, but that euphoria, being in this big, open sky, seeing the curvature of the Earth, it’s such a zen-like moment, that it kept me coming back to it. I still get nervous – I think that’s normal! Any favourite or really memorable jumps? My first jump – when you leave the plane it’s the doorway to a magical world of freedom, focus and fear. I remember landing and meeting a woman who’d just qualified on that jump. I said to myself ‘I’m going to be you one day.’ I still have a really special friendship with my first tandem instructor Ricky – skydiving is quite a niche sport and everyone knows everyone else – he’s been mentoring me ever since and is just as thrilled as I am that it was jumping with him that changed my life. Like so many sports, there are always new skills to learn, new levels to achieve. I’d been learning to ‘free fly’ (think snowboarding vs skiing – free flying is the snowboarding of jumping, where you’re flying in different positions, head up, head down, tracking) for a while and just wasn’t getting my qualification. When I finally achieved it, it felt like I’d won against my own frustrations, it was a fantastic moment. 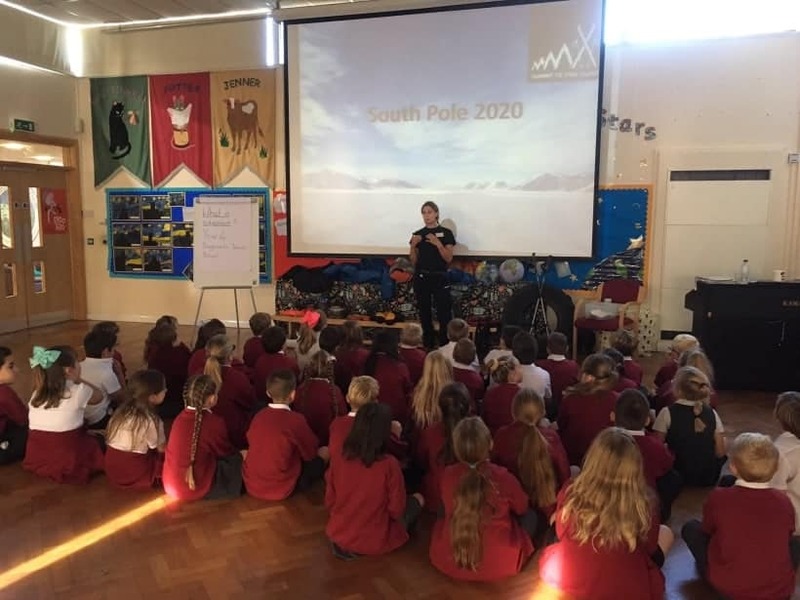 Tell us about the South Pole 2020! Skydiving has given me a really vital quality – doing something when you’re terrified. Being able to face and overcome your fears is something which can be applied to everything – having that difficult conversation about a relationship, a work presentation, or believing that you can do something when it’s a really, really big thing. I’m going to be pioneering a new route to the geographic South Pole in 2019, arriving at the South Pole in 2020. I’m expedition leader but a teammate is an experienced Polar adventurer, so we have the experience to get to the finish! I’m not the strongest or the fastest, but I am single-minded and determined. I’m also really inspired by the golden age of Polar exploration; by Shackleton, Amundsen and Mawson, and I was keen that the expedition could be even a tiny bit like those at the turn of the century – walking where no human had ever been before. We’re collecting some scientific data about the effect on the ice shelf of climate, and doing a study into mental health and human resilience. I’m also talking to wearable tech firms who are keen to test their kit in extreme environments. I created it!! I was the media manager for an expedition which did a full traverse of Antarctica. I was immersed in the build up to the expedition for two years, and was truly bitten by the Antarctica bug! It seems unlikely that you can just wake up one day and decide ‘I want to have a go at that’ but if you have a goal, that’s exactly what you can do. Whats your drive for doing this expedition? This expedition has evolved from ‘person goes to Antarctica’ to ‘mother of four sets world-first route to the South Pole.’ The response I’ve had from people has been humbling – words like ‘inspirational’ are hard to get used to when I’m the same person as I was two years ago. I’ve always seen opportunities, not barriers, and I want to say to people, especially young women and girls, and of course mothers, that yes, there are challenges; work, family, finance, but with planning, you can do anything. How did your family and friends respond when you told them? Almost unanimously, they are supportive, even if they don’t quite ‘get it’. My children reckon it’s safer than skydiving and therefore it’s a good thing (I’ve had a few broken bones from jumping already!). Their support – and that of my employer – is really important – but they don’t expect anything else from me!! Stepping out of the plane onto Antarctica is going to be a huge moment for me – in some senses it’s been three years, if you count my time with the team, it’ll be five, if you count it in other ways, I’ll have been waiting my whole life to take that first step onto the ice. But I’m also excited about the legacy – coming back and saying not ‘I’ve done this’ but ‘you can do this’. Costs involved in this expedition must be huge, how are you covering this? The costs of getting to Antarctica are huge. It will be around $300,000 (payment is in US Dollars, so I’m hoping for a Trump-related crash in the value of the dollar!). I’m putting some of my own money into this, as is only right, but I need big corporate supporters to make this happen. I feel like I’ve made good progress but a big headline sponsor is the magic that every expedition fundraiser is looking for. Any tips for people starting out looking for sponsorship, anything that has worked really well for you? Personal contacts can’t be beaten. I didn’t have big corporate contacts – I went out and found them. Think about where you live – is there a firm with local connections? What about what your expedition is setting out to achieve – is there an environmental, medical or other focus? DM a few social media contacts. Never take no for an answer and follow up every lead! Maybe a company can offer PR and marketing support, or kit – once you have that relationship, other things can come from it. What training is involved with this expedition? Mental training is just as important as physical training. Training for the monotony of 8-10 hours of skiing into a never-ending horizon, for your pulk getting snagged on things. 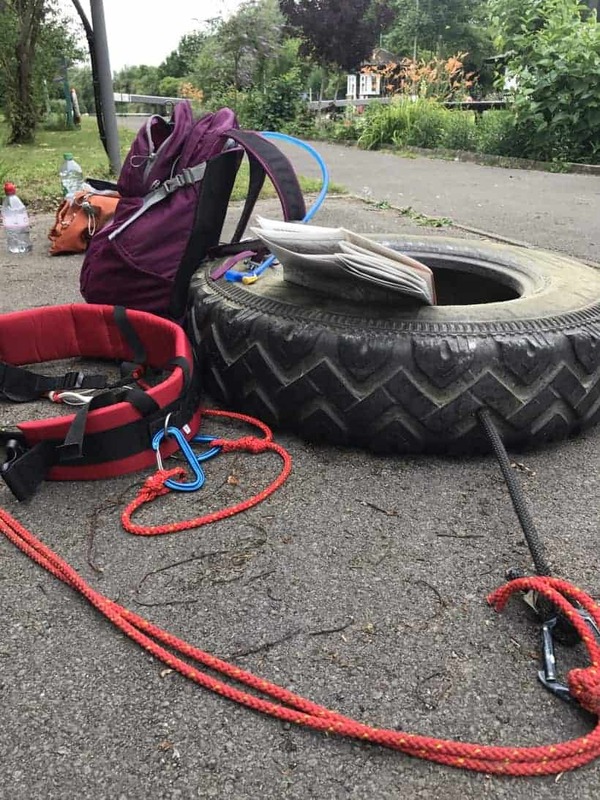 You can replicate this using a tyre, and hauling it up hills, along tracks and through fields – the mental game of not getting frustrated when the tyre gets caught on things or falls in ditches is as much a learning process as preparing your body. I do leg-strength work all the time – cycling to work, squats in the gym, tyre-hauling and a bit of yoga so I can still tie my shoelaces after a session! I build it into my day – I’m lucky to have a gym at work. I’m not too good at the whole nutrition thing at the moment though – I need to eat smarter – at the moment I just eat anything and everything pretty much all the time!! It must be hard managing this project alongside work and being a mum? Yes and no – it’s always on my mind and I do something towards it every day – write a blog, send an email, write a proposal, schedule a meeting. Work are amazingly flexible and deserve to be up there in lights as ‘supporters’. Sometimes the children will tell me when I’m too focused on the expedition work and I reign it in and spend the weekend with the family. What I would say though is that it never feels like a burden – I could easily do it as a full time job and it takes a lot of hours per week – but I have such a clear goal that I’m always motivated to work on it. Does your family ever come on your adventures? Sometimes the children will come out training with me when I can persuade them! When we’re away together we go walking and wild swimming and my youngest wants to be a mountain guide. When I think back to my own childhood, I want to give them those same experiences – even though at the time I didn’t always appreciate them!! I do things just with them too – we camped out in a meadow near our house when there was a meteor shower – it was really special, we lay outside wrapped in blankets wishing on the stars, then we slept out and squashed each other in the tent all night – that’s what makes the memories!! Is it true you tried on Scotts harness brought back from the Terra Nova Expedition….how did that happen?! My expedition launch was at the Oates Collection at Gilbert White House in Alton. One of my patron’s has written the definitive biography of Captain Oates (famous on the doomed Scott expedition for being the man who said ‘I’m just going outside, I may be some time.’ Sacrificing his life in the hope that his team mates would make it back safely). In the collection are some artefacts brought back from the tent where they found the bodies of Scott, Wilson and Bowers the following season. Scott’s original sledging harness was locked in a glass cabinet. I explained to the curator what I was doing and how inspired I was by the Polar greats. I asked to try on the harness. I thought he’d say no – he said ‘I’ll get the key.’ Putting it on was a really moving moment – it brought home all the hardship they endured and the disappointment they bore. The harness was nothing like the comfortable padded thing I have – it was canvas, metal and leather. It went twice round me, giving an indication of how cumbersome their warm layers were then. What would your advice be to your 10 year old self? The world is yours, if you want it. Do something fulfilling that helps the world (no one can love their job all the time). You have to work hard for the things you want. It’s ok to ask for help – you don’t have to know all the answers. Always! I’m going to be skiing across Greenland in May – 570km west to east – almost exactly the reverse route of that taken by Nansen, the first person ever to cross the Greenland Ice Sheet. It’s going to be a fantastic opportunity to test out kit, equipment, and put all that training into action! Ideally, I’ll take a week out in Spain at a favourite skydiving place near Seville – the British weather isn’t ideal for the sport! 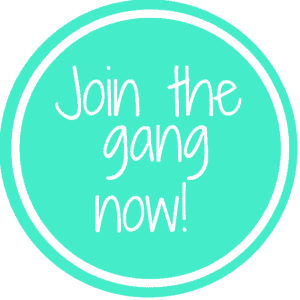 I’ve signed up with Mountain Training so I can eventually lead groups outdoors too. 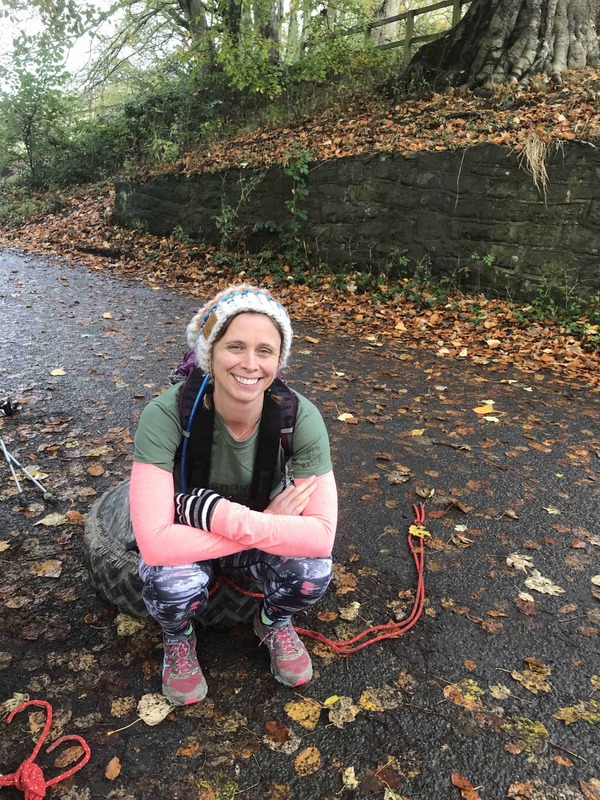 In early 2016 Bex Band quit her teaching job to set out on her first big adventure, hiking 1000km the length of Israel. Adventure is now her life and work! As well as running Love Her Wild, she also offers advice and inspiration through her blog, the Ordinary Adventurer.